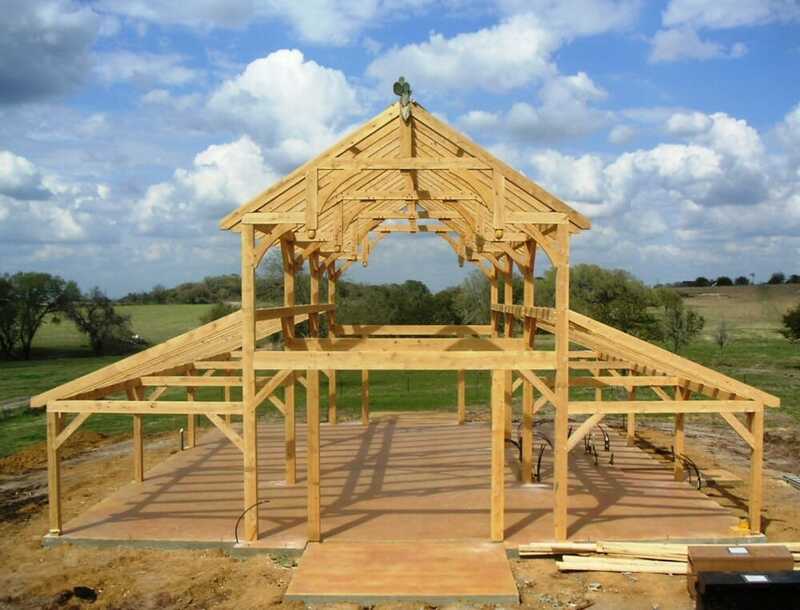 When people come to us looking for a Timber Frame Barn, often times they aren’t fully aware of all the different styles of barns that they can choose from. Today, we’re going to look at 4 basic styles of barns. Obviously, there are many more styles and variations out there, but these 4 barns will give a general idea of barn styles and options. 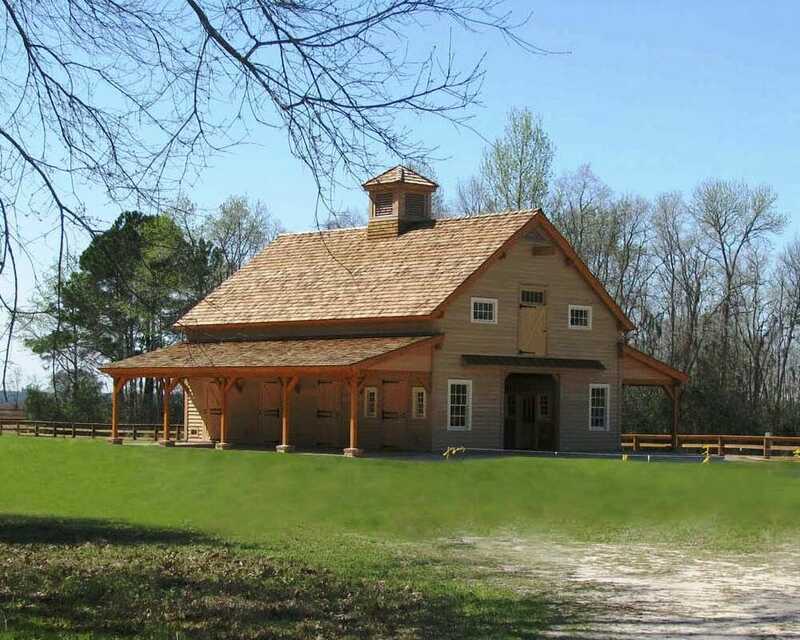 The Carolina Horse Barn is a Gable Style Barn with an A-Frame roof. 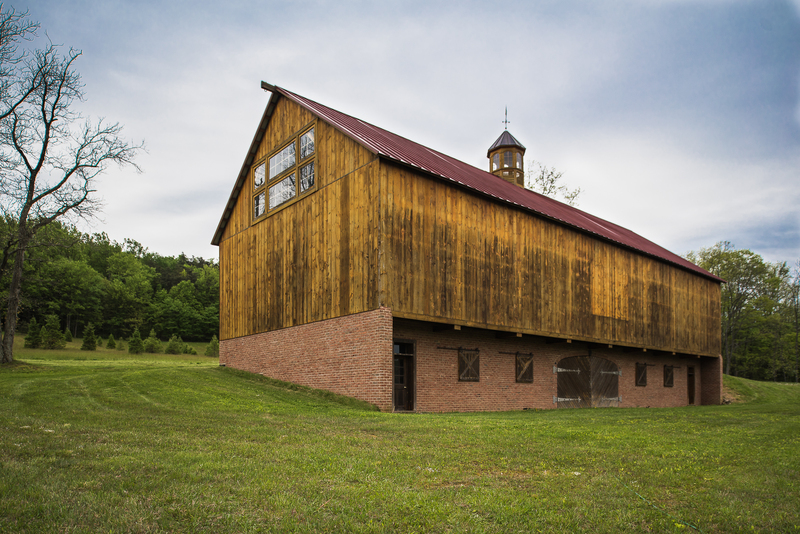 One of the defining characteristics of the Gable Barn is the distinctive “A” shape and steep pitch of the roof. A very old style of barn that originated in the time of the thatched roof, the steep pitch of the Gable allowed rainwater to run off the roof preventing it from being ruined by moisture. One thing to consider with the Gable Barn is that the attic or loft space available for storage may be less than that of the Gambrel or other styles of barn because of the pitch of the roof. 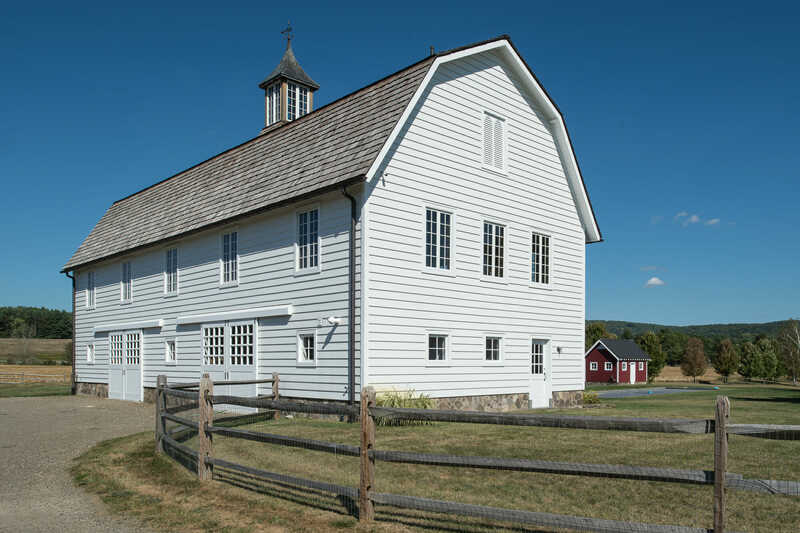 This barn in Hillsdale, NY is a Gambrel style barn. The Gambrel Barn has a roof with a double slope on each side. The Gambrel Roof offers the barn the most space for storage, which makes these barns popular as horse barns for their ability to store large quantities of hay and other supplies. A lot of people enjoy the Gambrel barn purely for aesthetic reasons, as the Gambrel has that vintage barn look that many people associate with older, classic barns. This barn in PA is built into the slope making it a Bank style barn. Like its name implies, the Bank Barn is a barn that is built into the side of a hill (or bank). Building a barn into a hill gives easy access to two levels of the barn with an entrance to ground level on both the first and second floor. By having access to both levels of the barn, if it’s built strong enough, one could easily store heavy equipment on either floor of the barn. This barn in Texas was built in the Monitor barn style. The Monitor Barn has a portion of raised roof in the center of the barn. The Monitor barn has a unique look and gives the builder the option of putting windows along the walls below the raised roof, letting in a ton of natural light. The raised roof takes away some of the storage space that could be available, but the trade-off is a unique aesthetic and natural lighting. These are 4 basic styles of barn that Vermont Timber Works offers. Any of these styles can be changed or adjusted to meet the needs of our clients, and of course we have experience building and raising all types and styles of custom designed barns. If you have any questions about Barns submit a question on our “Ask the Experts” page or give us a call at our workshop. i have been raising barns for ten years and before that i lived and worked at river spirit, a organic back to the land kind of commune. in Ca. Since I have had a stroke in Hawaii I found your web sight and wanted to tell you how much i liked it. Especially the photos, they helped me recover some of my timber dreams. Thank you George. That’s so nice to hear. i have been raising barns for ten years or more and before that i lived and worked at river spirit, a organic back to the land kind of commune. in Ca. Since I have had a stroke in Hawaii I found your web sight and wanted to tell you how much i liked it. Especially the photos, they helped me recover some of my timber dreams.